The SaxTuition Beginner Series is the complete package for learning how to play the saxophone. With 12 lesson videos, a PDF eBook and hundreds of playalong tracks, you'll always have something fun to play and techniques to challenge you along the way! Looking for the Tenor / Soprano version? At the cornerstone of the series are 12 saxophone lesson videos (over 3 hours of video content) designed to teach you how to play saxophone from scratch. Each lesson picks up where the last one left off, making the whole series easy to follow! For every lesson video, there's an accompanying chapter in the 68 page eBook which backs up the techniques being taught and gives you a ton of fun pieces and exercises to play! If you've never read music before, the book walks you through the steps of understanding music notation. With over 200 playalong tracks for each and every piece in the book, you'll always have a track to jam along with! Because learning new songs is always easier when you have an audio reference, nearly every piece and exercise in the book comes with slow and fast versions. Learn at home, at your own pace. The SaxTuition Beginner Series is designed to create a real, 1-1 saxophone lesson experience. Like a real lesson, each video leads on right from where the last left off, and builds on a variety of skills simultaneously. Our longer form lessons (avg. 15mins) mean you won't have to sift through short, disjointed videos wondering what to watch next. The SaxTuition Beginner Series covers every note of the regular range on the saxophone, so you'll learn all the fingerings needed to play your favourite tunes! From jazz, classical, folk and in-between you'll learn a wide variety of fun, challenging songs that you can perform for concerts, friends or family. SaxTuition doesn't just teach the saxophone, we teach you how to be a well rounded musician. That includes reading music, understanding pitch, tuning, rhythm and much more. 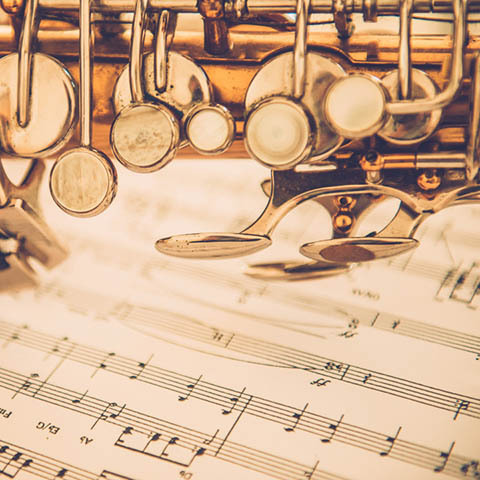 The SaxTuition Beginner Series assumes no prior knowledge from the student, but that doesn't mean that more experienced students can't get something out of it too! Have a listen to a couple of songs from the end of the series below - this will help you to get an idea of the standard that we build to throughout the series. Watch the first lesson for free! "There's a song I'd love to learn!" Is there a band or song that inspired you to play the saxophone? Are you itching to learn that one song that you can't get out of your head? We get it! SaxTuition gives you all the tools you need to learn any music you want to play, now and into the future. With SaxTuition, you'll learn every note on the saxophone, how to read music, how to articulate and most importantly - how to get a great sound! Above: A photo taken on-stage by Jeremy in Buffalo, NY whilst performing with Saint Motel. Jeremy Trezona is a professional saxophonist, composer and founder of SaxTuition. Jeremy holds a Masters of Music (Jazz Saxophone) from the University of Southern California in Los Angeles, and has performed around the globe on stages such as Coachella, Central Park, The Greek Theatre, Jimmy Kimmel Live, Conan O'Brien, The Today Show, X-Factor, Milan Fashion Week and more. Jeremy is a published academic author on the topic of cross-genre saxophone performance, and is a former touring member of pop / rock group Saint Motel. Longer form lessons (avg. 15 mins) packed with clear, concise content. Learn a variety of skills at once! 12 video tutorials, a comprehensive PDF eBook, hundreds of playalong tracks and let's not forget - no subscriptions! Jeremy has toured the world as a saxophonist playing at Coachella, X-Factor, Jimmy Kimmel, Conan O'Brien and many more. SaxTuition is a small business, and we care about each and every student who learns with us. Having trouble with something in the series? Send us an email and we'd be happy to help! Otherwise, we also offer a full refund within 30 days of purchase if the series fails to live up to your expectations. A secure download link will be made available on the purchase confirmation page, and will also be automatically emailed to you within a few minutes of your purchase. Is the SaxTuition Beginner Series for all saxophones? Yes. SaxTuition comes in both Eb (Alto & Baritone) and Bb (Tenor & Soprano) versions, so just make sure to select the pack you require in the store before checkout. If you accidentally select the wrong pack, send us an email at hello@saxtuition.com and we'll sort it out! What equipment will I need before starting the series? 2. About 5 saxophone reeds of approximately 1.5 or 2 hardness. Make sure you get reeds that match your saxophone, e.g. alto reeds for alto saxophone, tenor reeds for tenor saxophone etc. 3. A neckstrap, mouthpiece and ligature (metal ring around mouthpiece). Ideally you'll also have a cleaning kit (polishing cloth) and pull-through cloth as well. 4. 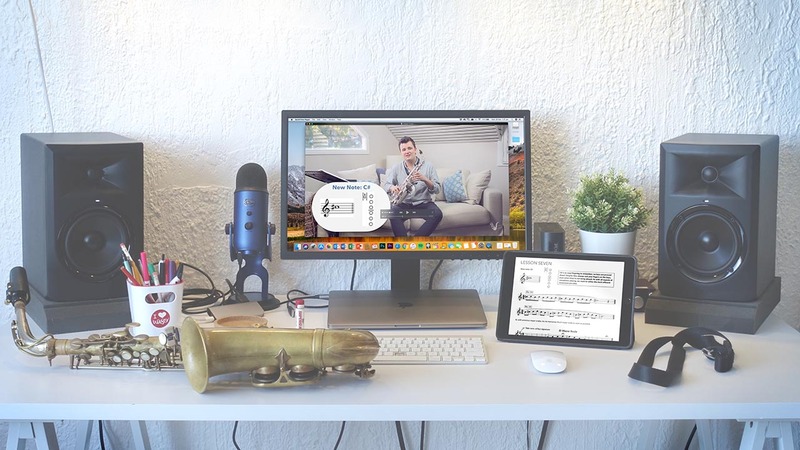 A working computer that you can use to download and unzip the SaxTuition files! I can't read music! Can I still learn with SaxTuition? Absolutely! The SaxTuition Beginner Series assumes no prior musical knowledge of it's students. You will learn to read music as you learn the saxophone. Is this a subscription based service? No. There is just one fee for the whole series, no ongoing costs whatsoever! Providing a high quality product is really important to us. If you feel like the series failed to meet your expectations, we will happily provide a full refund of your purchase within 30 days of your purchase date. Please get in touch with us from our contact page and we will sort this out ASAP. Never played sax before, but this is teaching me everything I need to know... Thanks!! Best way to learn saxophone! This series is amazing. You learn how to read music, and learn the basics of sax at the same time. I only had basic music education but now I can actually read music and play sax!